Do you remember the last time you listened to music so beautiful it gave you shivers? Do you remember being amazed at the kindness and beauty in the human soul? This album brings both of those elements into play as you listen. I was not only struck by the sheer beauty of the soothing piano compositions, I was filled with such appreciation for the amazing abilities God gives artists so they can generously give beauty to the world. “Music is…?” was the subject heading of an e-mail sent out by Kathy Parsons in the first week of September, 2001. She sent the e-mail to a group of pianists and composers and asked them to fill in the blank. At the time she was writing an article for her newsletter “Pianotes.” This newsletter is about how music is experienced, created and lived. Then September 11th unfolded before Kathy’s eyes. Writing music was what he loved to do most and he knew others would want to also help in some way. Eric suggested a long list of composers to Kathy. Together they created a 501(c)(3) nonprofit organization to help launch the idea. After receiving music from various keyboard composers, they had to select musical tracks that would fit together in a unified ensemble. Seventeen tracks were chosen for this CD. This contemporary piano music compilation was then released on September 11, 2002. A delicate, exquisite expression of hope amidst sorrow. Seems to speak of a place beyond this life. As if the walls move away and open to release all feelings of pain and you feel peace. Begins with a wilderness feel, perhaps a thunderstorm. The deep soothing vibrations in this piece balance sadness with joy. Janie Campbell is known for her music which enables individuals to connect with their emotions and experience comfort. An evocative duet between Boswell and Tillman. The cello and keyboard help to transport the listener into a deep sense of peace and security. This piece borders on worship. Very healing. Upbeat and hopeful with elements that seem to embrace you in warmth. Within the tragedy, this brings to mind all the miracles and love shown. A meditative piece which encourages tranquility. Perhaps like the slow trickle of melting snow. This was composed after the 9/11 incident and reflects deep sorrow and loss. It has an element of “becoming aware” of the deep pain hate can cause. At times the piece waits for your thoughts and then at times seems to make definite statements. Feels like an awakening on a new day. Realizing that in deep sorrow there is a time to feel as if you are dying and then you can follow a path to rebirth. Passionate piece that says there is still kindness and beauty in the world. The minor and major keys reflect sadness and hope. Heartfelt piece which encourages introspection. This piece was written for the men and women who offered their aid and protection. Thankfulness and peace are present in the soaring melodic lines. After you hear this piece, you will want all his albums. They are intensely beautiful and very relaxing! This piece speaks of coming home to family and friends and has a smooth sway like the calm sway of a porch swing on a summer night. Jeff made me aware of the HeartAid album and is also involved in other very significant humanitarian efforts in his daily life. He is a board member for Life Water an organization that equips, trains, and empowers local villagers to drill and maintain their own clean safe water wells. Bad water is the leading cause of death in the world and this organization has found a way to save lives by helping to filter out water-born illnesses. notes that are sophisticated and elegant. A jazz duet signaling the conclusion of this musical journey. Contemplative keyboard melodies dance around the calming saxophone improvisations. Seems to speak of a new day and renewal. 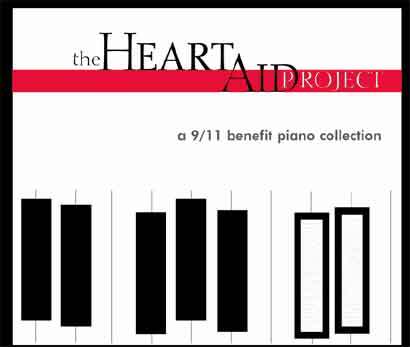 The proceeds from The HeartAid Project CD will be donated to charities benefiting 9/11 and their families. Each artist has decided to donate all the royalties from this album to The HeartAid Project and its healing mission. Music speaks to us in a way words can’t. Music can heal the heart. Out of a great tragedy comes intense beauty. What a wonderful way to express love and care.